A dual purpose annual herb, Coriander is grown for its seeds or fresh young leaves. 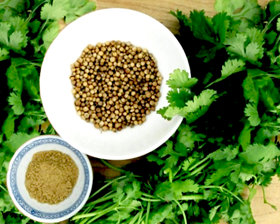 Coriander seeds are delicious in cakes and when crushed, add an orangey flavour to meat dishes. The young leaves of Coriander are often called 'Cilantro'; finely chop and add to chicken soup to give it a Latin touch or soak the crushed seeds in hot water and add the liquid only to cubes of pork simmering in tomatoes for a real Mexican flavour. Sow coriander seeds repeatedly in early spring till late summer, 1cm deep in ordinary garden soil which has been raked to a fine tilth.